Heat oven to 350°F. Spray 8-inch square (2-quart) glass baking dish with cooking spray. 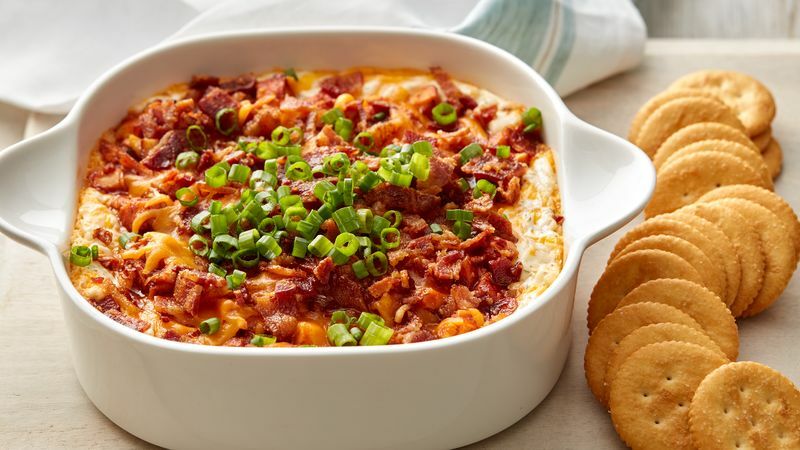 In medium bowl, mix 1 1/2 cups of the Cheddar cheese, the cream cheese, sour cream and ranch dip mix. Spread evenly in baking dish. In medium bowl, mix chicken, barbecue sauce and green onion whites. Spoon evenly over cheese mixture in baking dish. Top with remaining 1/2 cup Cheddar cheese, then top with cooked bacon. Bake 20 to 25 minutes or until hot and bubbling at edges. Top dip with green onion greens; serve with crackers. Rotisserie chicken works well in this recipe, but any leftover cooked chicken will do. Feel free to use your favorite crackers for serving, but we prefer to serve with Ritz™ crackers.